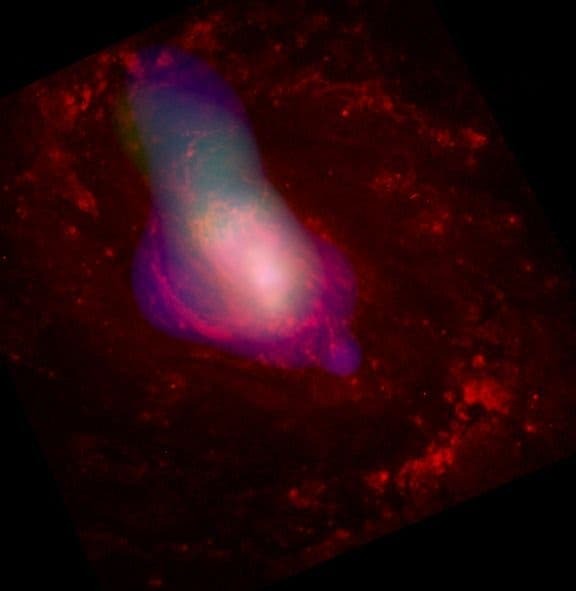 The X-ray emissions of the newly discoovered galaxies are so heavily absorbed that little more than a dozen are known. Yet astronomers say that despite the deeply dimmed X-rays, the sources may represent the tip of the iceberg, accounting for at least one-fifth of all active galaxies. Since 2004, Swift's Burst Alert Telescope (BAT), developed and operated at NASA Goddard, has been mapping the entire sky in hard X-rays with energies between 15,000 and 200,000 electron volts — thousands of times the energy of visible light. Gradually building up its exposure year after year, the survey is now the largest, most sensitive and most complete census at these energies. It includes hundreds of active galaxies out to a distance of 650 million light-years. "With Swift we have now quantified exactly how many active galaxies there are around us — really, in our back yard," said Marco Ajello at the SLAC National Accelerator Laboratory, Menlo Park, Calif. "The number is large, and it agrees with models that say they are responsible for most of the X-ray background." If the numbers remain consistent at greater distances, when the universe was substantially younger, then there are enough supermassive black holes to account for the cosmic X-ray background. "This is the first time we could investigate the average spectrum of heavily absorbed active galaxies," said Ajello. "These galaxies are responsible for the shape of the cosmic X-ray background — they create the peak of its energy."